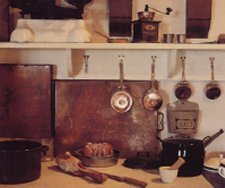 The kitchen was built as part of the restoration of the castle between 1912 and 1932 and was in keeping with the rest of the castle's style. A generator was installed in 1928 which was used almost exclusively for lighting. 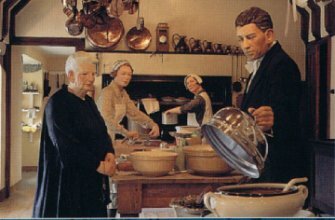 There was no fridge or electric cooker and all the cooking was done on the Carron Ironworks range which burned coal.The mix of utensils, some brought from other MacRae-Gilstrap homes, resulted in a range of styles from Victorian to the 1930's.